Adopting a smoking habit must rank as one of the dumbest decisions a teenager can make, and guess what? I did just that in around 1986, a move thought previously impossible by friends who knew me as a vociferous anti-smoker. But things change and you don’t really know what to expect until you actually try it, a fateful act that until five weeks ago had me spending a small fortune to feed an unsociable habit that slowly suffocates you. There were many reasons for quitting the vile habit; it does, after all, come with a range of deeply unpleasant side effects, the most ominous being the prospect of being told that the routine has helped in the formation of a cancerous tumour. Sadly, there won’t be too many people receiving this blog whose lives haven’t been impacted by cancer, either through the condition afflicting themselves, or a relative, friend, colleague, or neighbour. In fact, Cancer Research UK note that in 2011 331,487 people in the UK were diagnosed with a form of cancer, and of that figure 13 per cent were told they had cancer of the prostate gland. The good news is that early interventions can greatly increase the chances of survival and yesterday The Engineer had the privilege of observing one way in which engineers are providing the tools that are helping surgeons battle the odious disease. Guy’s Hospital, London played host to the Richard Tiptaft visiting Professorship, a conference that streamed a live, ‘robot’ assisted radical prostatectomy taking place in the hospital using a da Vinci Si machine. 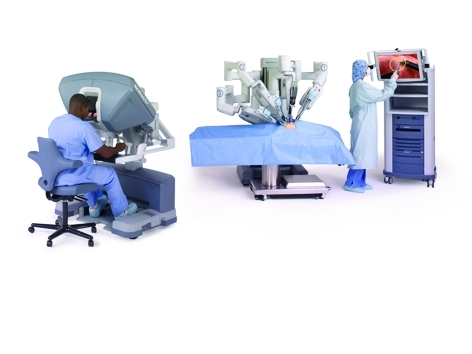 To recap, the da Vinci Si from Sunnyvale, California-based Intuitive Surgical, is operated by a human surgeon who uses a video equipped workstation to control four tool-tipped arms that are inserted laprascopically into the patient. Not being familiar with surgical procedures, it was striking how rapidly one of the surgical team was moving his hands – and therefore the Da Vinci Si’s surgical tools – to get to the infected gland. The rapidity of hand movement and the operation of the instruments did not, however, have anything to do with a requirement to get the job done quickly. Rather, it was the surgical precision offered by da Vinci that let the theatre team clamp and cut their way to the patient’s prostate without damaging surrounding nerves. Prof Prokar Dasgupta, chair of robotic surgery and urological innovation, King’s College London, Guy’s and St Thomas’ NHS Foundation Trust told The Engineer that the da Vinci machine can be set to filter the surgeon’s hand movements. ‘For example, if he’s set it to 1:5 every time a surgeon moves – say 5cm – the machine actually moves 1cm,’ he said. ‘Furthermore, there’s no tremor. If you see a very experienced…surgeon – and watch them very carefully – there will be some tremor on the tips of their instruments… it [da Vinci] can also filter the tremor. It must be difficult, however, to operate a tool remotely without any form of haptic feedback, especially when you’re working with living tissue? Not so, explained Prof Dasgupta, and again an engineered solution has helped surgical teams visualise what they operating on in order to safely and precisely remove anomalies. ‘What makes up for the lack of haptic feedback is the 3D high-definition (HD) image, which is 1080 dots per inch,’ he said. ‘The view is magnified at least 10 times, perhaps even more, so the prostate, which is small gland, looks like a football. On static display at Guy’s was the Xi, the latest in the da Vinci family that last week received CE clearance. The Xi, explained Prof Dasgupta, is a smaller machine that has a gantry which allows the robot to be docked onto a patient with the guidance of a laser, a modification that brings added functionalities. ‘It allows for multidisciplinary robotics, i.e. not just bladder, not just kidney, not just prostate but robotics in the mouth, robotics for children, robotics for the bowel,’ he said. 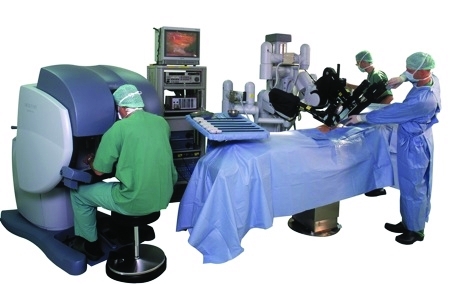 One could argue the toss over the term ‘robotic’ and Intuitive Surgical themselves say the da Vinci system ‘is not robotic surgery in the strictest sense of the term’ as the system has no autonomy. The important piece here, however, is that radical prostatectomy offers patients a better chance of survival compared to radiotherapy and da Vinci is one tool helping surgeons improve patient outcomes. Semantics aside, Guy’s and St Thomas’ and Kings were named yesterday as the UK’s first Robotic Surgery Institute and earlier in the week a report indicated how the UK’s economic growth could be stimulated by robotics and autonomous systems (RAS). Guy’s and St Thomas’ handles around 400 robotic surgery cases a year, and this week’s report indicates that engineers are in a position to manoeuvre RAS systems into decommissioned nuclear sites, farms, factories, mines and whole towns, for use as test beds that could eventually see the UK tap a market worth between $1.9 – $6.4tn per year by 2025 in terms of its global economic impact. Whilst the robot has largely been in fiction as a sinister anomaly, it is clear RAS will likely do the reverse. Engineered correctly, RAS will provide three essential roles: functionality that makes them highly assistive; a hook into which skills can be grown and retained; and – much beloved by so many – financial profitability. In the mid 1980s, if it had not been for a Houston Omnigraphic plotter and a custom drafting/lettering program written by an undergraduate, I would have had to hire someone to ink my dissertation figures. Even with the guide templates, I could not control the pen. And, my patience was seriously lacking. BTW, the program was written in Fortran running on a Data General Nova minicomputer and using a 1968 Tektronix storage terminal.